Recent neuroscience research has demonstrated that meditation practice strengthens neural pathways and thickens neural tissues, enabling a much higher capacity for such things as shifting emotional states, practicing good judgement when under duress, and practicing restraint under trying circumstances. I heartily recommend a frequent practice of what I call "Brain Workout Meditation." The kernel of this technique is old; experienced meditators will recognize it as a standard approach that originated thousands of years ago. 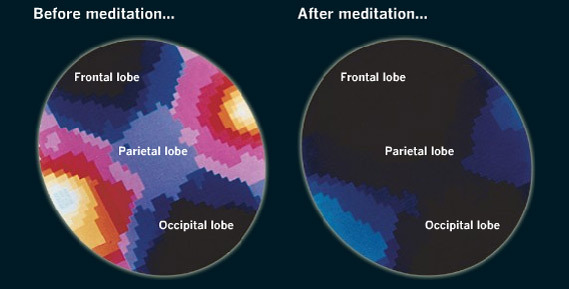 What's different with Brain Workout Meditation? It's this: Your purpose is neurological, not spiritual. You are not aiming for enlightenment or insight or serenity, even if those things happen as a by-product. You're working out your brain in order to stimulate improved emotional/cognitive function and integration. Having this as your goal affects how you practice, and helps you to optimize the neurological benefits. If you find that your brain is getting distracted every few nanoseconds, there's no need to be discouraged: the distraction is an essential part of the exercise. The "workout" part is what comes right after the distraction - that's when you gently draw your attention back to your breath. These instructions may strike you as being simple; that means you're getting the idea. This is a simple exercise, and you can get it right away by trying it. And as soon as you begin trying, you begin rewiring your brain in a remarkably beneficial way. (1) Get in a comfortable position. For BWM, there is no benefit to holding a particular posture unless it supports your workout. (2) Pick a body location where you can feel your breath moving in and out - the mouth/nose, the chest, or the belly. Focus on the physical feeling of breathing - in, out, in, out. Don't control or "steer" your breath, just allow it to follow its natural course, unfolding in an uneven way according to its wont. Many people find it useful to actually silently think "In, out, in, out" as they breathe, but take care that your focus remains with the physical experience of the breath, and doesn't shift to just thinking of those words. (3) When other mental/emotional/physical events happen (thoughts, feelings, sensations, worries, etc. ), acknowledge them and GENTLY draw your attention back to your breath. (4) Continue for a period of time that is comfortable and not ambitious - 30 seconds is fine if that's what feels comfortable, or if that's what you have time for. If you practice regularly you will find that you want to do it for longer, and more frequently. I recommend that you wait until you feel the desire to go longer before increasing the duration of your brain workout. Trust that this will happen on its own.